04-Jan-2013: improved some nginx.conf settings. For maintenance of our Home Server we need an internal web server. 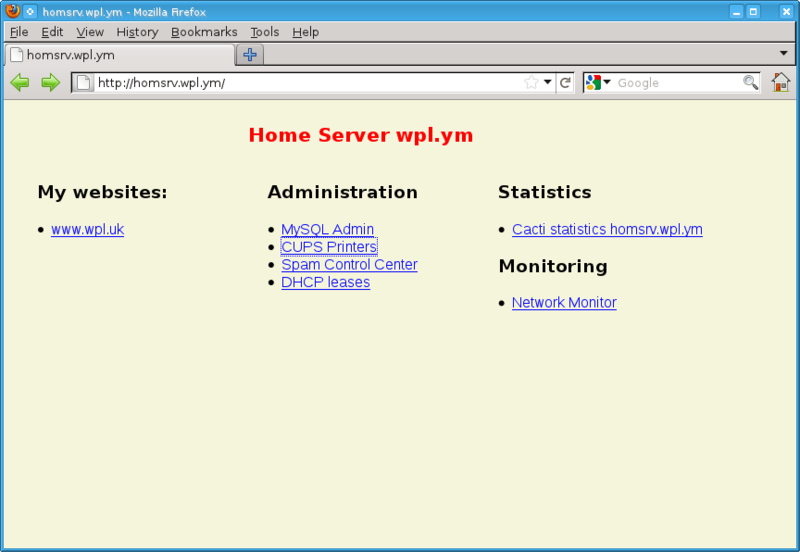 On this server we can install things for example like phpMyAdmin to have easy access to our MySQL server. We could also create a Intra-net server, but in a Home environment that is not so useful. Slackware’s standard web server is Apache, but I have seen that nginx (engine-X) performs better and uses less memory. The performance issue is not so important for a maintenance web server, but nginx is more flexible to configure compared with Apache. Each virtual server can have it’s own special setup, and using several virtual servers for a maintenance server is a good plan. For this article I start with just one virtual server. To use php with nginx you need to have php-fpm. This is the Fast Process Manager that takes a php request from nginx and hands it over to php, and then returns the processed results back to nginx. Since Slackware 14.0 the php package is build with php-fpm support so you can use the shipped package. If you use an older Slackware, you must build php yourself to include php-fpm support. Use pkgtool to activate fcgiwrap to start at boot. That’s it. In the support archive is a sample home page with some links to existing and feature utilities.